Like many of the world’s shorelines, the South Bay is expected to be increasingly impacted by sea level rise due to climate change in the coming decades. With the wealth of commercial development and infrastructure located in the South Bay that’s precariously positioned to be threatened by damaging flood events, steps are being taken to make the shoreline more resilient to higher water levels. 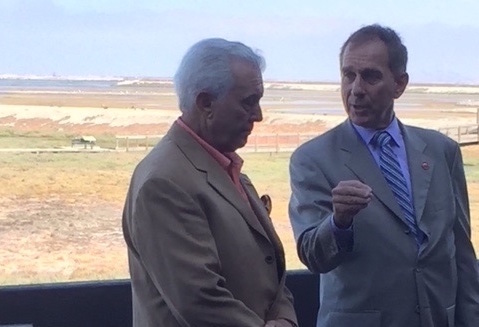 Senator Bob Wieckowski authored Senate Bill 881 to help fund the South San Francisco Bay Shoreline Project aimed at protecting businesses and homes against flooding. In August, the bill that’s received wide support and no opposition passed through the Senate and awaits a signature from Governor Jerry Brown. The project involves the construction of four miles of 15-foot tall levees along the shore stretching from north San Jose to the Alviso Slough/Guadalupe River and Coyote Creek. It will also restore marshlands and wildlife habitats that were lost in the past, and enhance these areas to help absorb excess water flow. Another aspect of the project is the extension of Bay Trail. The goals of the project are to protect the area from two feet of sea level rise, protect low-lying areas from flooding, restore 3.5 square miles of wetland habitat, restore habitat for wildlife and provide the public with outdoor recreational opportunities. In addition to protecting waste water facilities, the flood protection measures will protect several nearby companies that are crucial to the region’s economy such as Google, Cisco and the NASA/Ames Research Center. SB 881 has been endorsed by the Santa Clara Chamber of Commerce, Santa Clara Valley Water District, Silicon Valley Leadership Group, Milpitas Chamber of Commerce, Mid-Peninsula Regional Open Space District and City of Palo Alto, among other entities. Nick Kaspar, president of the Santa Clara Chamber of Commerce explained that the Santa Clara Valley Water District made a presentation to the Chamber about SB 881, and after review by the Chamber’s government relations committee, support was given for the measure. The whole project will cost about $177 million and is part of a larger state and federal effort to prepare the Bay Area for increasing sea level rise. Senate Bill 881 would allow the Shoreline Project to receive flood control funding from the state. The project’s timing coincides with other flood prevention measures such as San Francisco’s Seawall Resiliency Project.